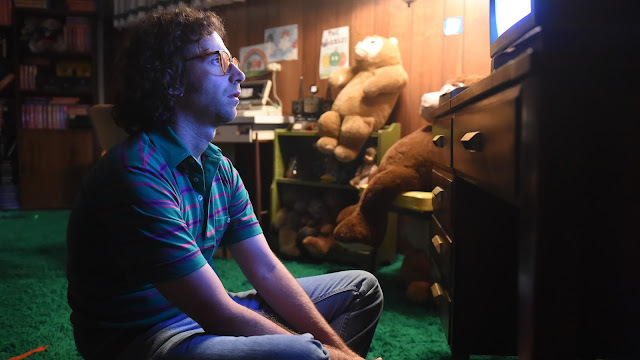 Good Neighbor sketch comedy members, first-time director Dave McCary and Saturday Night Live comedian Kyle Mooney, have created a truly bizarre yet oddly super sweet film celebrating the art of amateur filmmaking and pop culture obsession. Brigbsy Bear is a strangely grounded but absurd vision of childlike imagination and wonder transplanted into a sadly extended adulthood. Produced by The Lonely Island as well as Phil Lord and Christopher Miller, childhood friends and co-writers Mooney and Kevin Costello provide a tragic backstory to explain their weird vision of fan fiction and online video culture. Mooney plays James Pope, a 25-year-old man raised in captivity by his abductors (Mark Hamill and Jane Adams), who returns to his real parents (Matt Walsh and Michaela Watkins) and struggles to adjust to an outside world obsessed with media culture. This seriously dark premise (reminiscent of Room) is an excuse for the indie comedy to indulge the idea of fandom as James is obsessed with a fake children's entertainment program watched on VHS tapes in his underground bunker that were actually made by his kidnappers as a way to enforce their educational control and constructed lies. Mooney's performance is so deadpan and earnest yet somehow wholly natural. It makes you wonder how they managed to write such strange material as an elaborate excuse for his brand of offbeat comedic acting. Hamill and Adams are perfectly sinister in their twisted love for their supposed son while Walsh and Watkins are emotionally loving in their earnestness. Greg Kinnear and Claire Danes show up in nice supporting turns as the detective and therapist tasked to help James adjust to reality. Ryan Simpkins is all too real as James' moody sister experiencing mixed emotions about the brother she never knew and his abrupt return. McCary and Mooney have a lot to say about contemporary society and use James' naïveté to explore our strange but accepted obsessions or practices while finding joy in authentic experiences. People unironically marvel at his tragic life and are entertainment by the strange entertainment of his retro propaganda videos used in his captivity. Themes of outsider experiences, using creativity as a way to relate to strangers, and friendship through art are mostly well executed. What's so remarkable about Brigsby Bear is the sincerity of the fictional show within the film and its recreation as reverence. Mooney shows James' genuine wonder and excitement when he learns that anyone can create and make their own shows. His reaction is priceless. The whole movie is an admirable metaphorical celebration of creativity.